We often advocate for living healthier and more active lifestyles that include spending more time outside practicing a sport. However, a walk in nature could prove dangerous as the streets, parks, and forests are full of threatening species of plants, insects, and animals. Ticks should be one of the major concerns for you, your kids, and your pets as they can cause severe damage to your health. These parasites rely on reptiles, birds, and mammals to survive. Some tick species cause paralysis, typhoid fever, Lyme disease, and other serious health problems that can even lead to death. Ticks are quite sensitive to certain weather conditions such as cold temperatures of -4 degrees Fahrenheit and below. There are also certain worms and wasps that can kill ticks, while snakeheads are known to consume large amounts of ticks. If you were bitten by a tick and wanted to make sure you’re fine, here are some easy tips and tricks to follow. 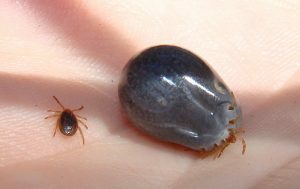 Although ticks won’t seek blood during the winter time, they can wait until the cold months are over and emerge back at the beginning of March. The tick season lasts until the end of summer, so it would be better to prevent being bitten than trying to remove a tick on your own. Therefore, we suggest taking a shower as soon as you get home from running or walking your dog in the park. You can also apply repellant sprays or lotions that will keep ticks, flies, and mosquitos away from your skin for up to 8 hours. However, pay attention to the ingredient list. Most lotions you will find in supermarkets, and convenience stores contain chemicals that might harm your sensitive skin or cause allergic reactions. Therefore, we would suggest choosing organic products made with natural ingredients such as mint, spearmint, and chamomile. Wearing long sleeves and long pants will also keep you away from harmful sun rays and ticks during summer time. 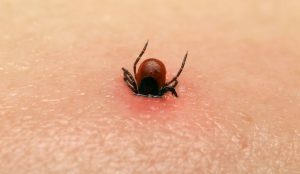 Although you might have heard of a dozen different ways to remove ticks, your most reliable ally remains a good pair of tweezers. Use a tweezer with fine tips instead of blunt ones as the head of the tick is small. Aim for the tick’s mouth and get the tweezers as close to it as possible. Don’t try using your fingers as you won’t get a good grip. You shouldn’t grasp the body either as it will determine the tick to inject blood or saliva in your skin, increasing the risk of transmitting dangerous diseases. Once you got the tick’s mouth, you have to pull steadily and firmly outward, without twisting or wiggling the tweezers as you pull. If your attempt was successful, all you have to do now is to thoroughly wash the area using soap and warm water. You can also use alcohol, iodine or hydrogen peroxide as all these substances will clean and get you rid of potential infections. After you extracted the tick, you can either kill it or put it in a sealed bag and take it away for testing to make sure you weren’t infected with any dangerous disease. No matter your choice, avoid crushing it with your fingers as the substances resulted might get in contact with your skin and still infect you. Another method you can opt for in the comfort of your own home includes a piece of regular dental floss. Use a thin piece of unwaxed floss or any other type of string to loop it around the tick’s head. Make sure the string stays as close as possible to your skin. Tighten the string around the head and use both your hands to pull the floss. If you succeeded, don’t forget to clean the area with alcohol or soap and water after you finished. If you have troubles removing the tick yourself, you can also ask for the help of a doctor. A physician will always have the right sterilized tools and will help you extract the tick even if it is very small.